Remains there indefinitely at President Obama’s request. Militants. A fact that President Obama wanted to be kept secret. Announcing New Partnership with Art21! 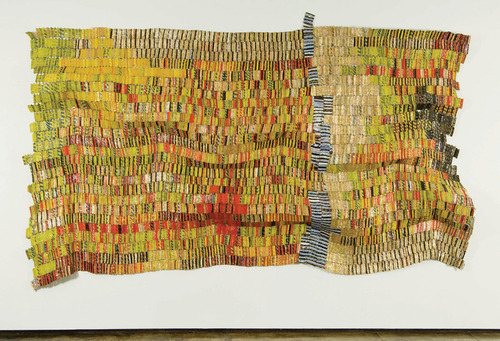 El Anatsui, River Crossing, 2007. Aluminum and copper wire; 103 x 141 inches. Courtesy the artist and Jack Shainman Gallery, New York. We are pleased to announce our partnership with Art21, a nonprofit dedicated to engaging audiences with contemporary visual art, inspiring creative thinking, and educating a new generation about artists working today. At the dawn of the twenty-first century, American artists are taking self-expression and the artistic process into uncharted territory. Today’s artists are engaging the world and their audiences in vital and surprising new ways. They use an enormous variety of media and draw on sources ranging from pop culture and politics to ethnic heritage, classical models and deeply personal life experiences. The artists featured in the series represent a cross-section of contemporary art practices and philosophies, and hail from different regions of the United States. The Studio Museum in Harlem has selected four episodes featuring artists also in the Museum’s exhibitions, publications and permanent collection: Kerry James Marshall, Layla Ali, El Anatsui and Glenn Ligon. The episodes featuring these artists embrace diverse concepts to provide a platform for conversation: IDENTITY/POWER/CHANGE/HISTORY. Inner City seeks cash lifeline. Less than one month after a bankruptcy judge approved the sale of Inner City Broadcastings assets to YMF Media, the company is asking the court to give it access to cash as a lifeline to keep the operation running smoothly until the new owners can take over. Inner City is also planning to move from its current New York headquarters to save money. Social Security to Go Paperless in 2013: The U.S. Treasury will stop mailing paper checks to Social Security beneficiaries on March 1, 2013. All federal benefit recipients will then receive their payments by direct deposit to a bank or credit union account or loaded onto a Direct Express Debit MasterCard.